which I thought I would share. and labelled with an "S" on this little tag. some of her grey dyed fabric and laces! in all the co-ordinating shades of greys! which you so beautifully and thoughtfully created for me! containing a little cabinet card. which I incorporated into this rustic heart. with some buttons came pre-rusted naturally! to see more images in greys! Labels: GreyDey Thursdey, hearts in greys, rustic heart. Just what you love! Enjoy these beautiful handmade things and the weekend, too! Hugs! 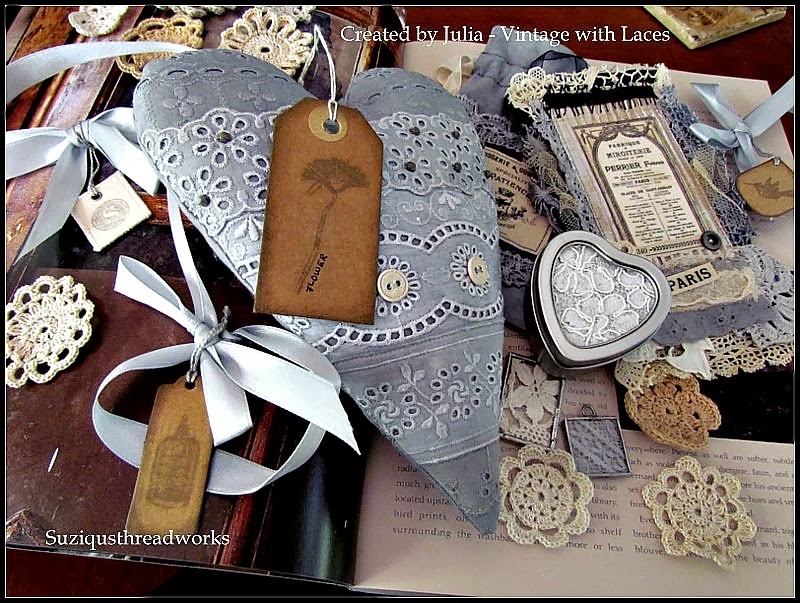 The lace is so unusual and pretty in the greys. Such a pretty handmade heart! What lovely treasures to open up! 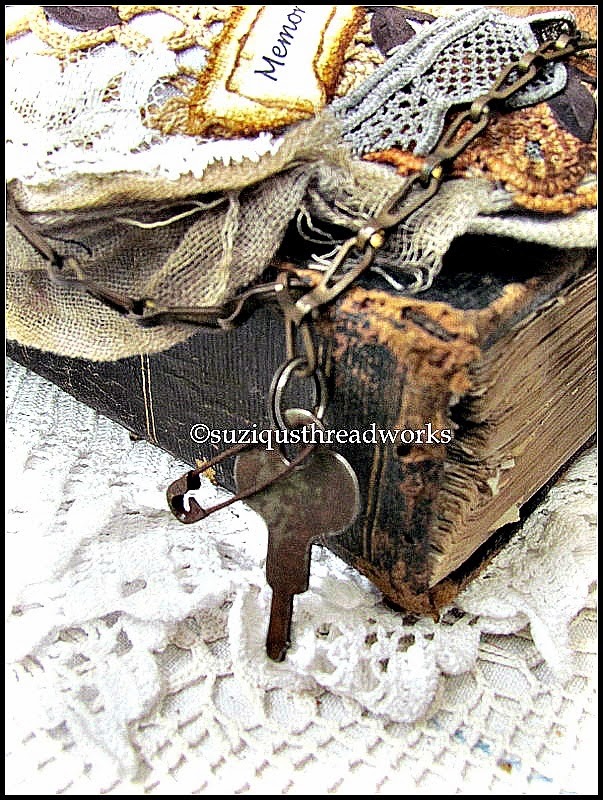 I am in awe of your creations, Suzy! 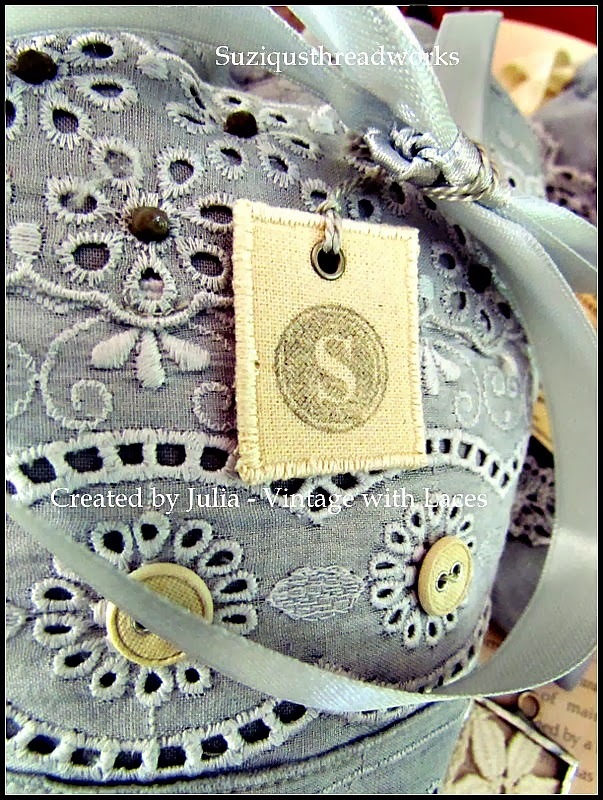 I'm glad you like my grey creations and already used one of the crocheted flowers, my dearest Suzy. 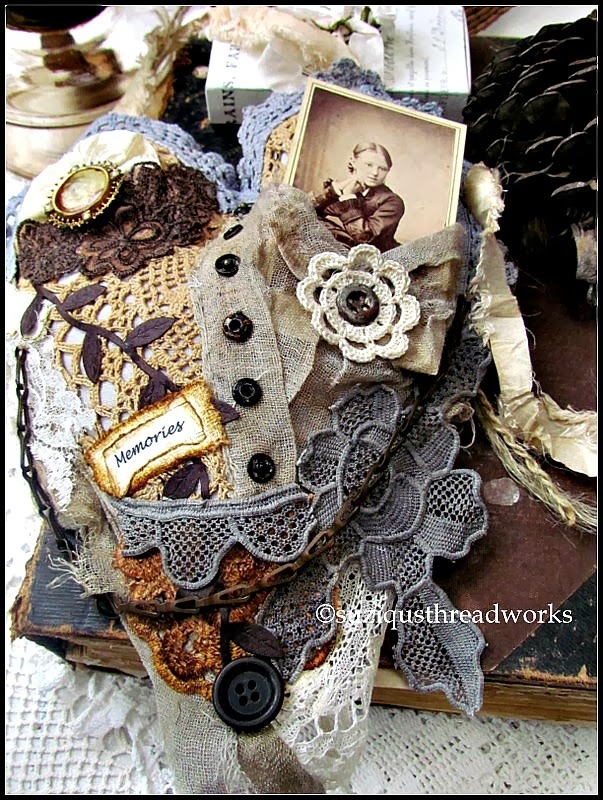 Your rustic heart with all the bits of beautiful laces is just gorgeous. Those press studs and the pocket are wonderful details. Have a happy weekend, sweet friend :)! And I see you've got a very good inspiration.Marvellous heart you made! What a wonderful gift. All of those grey's look so good together. 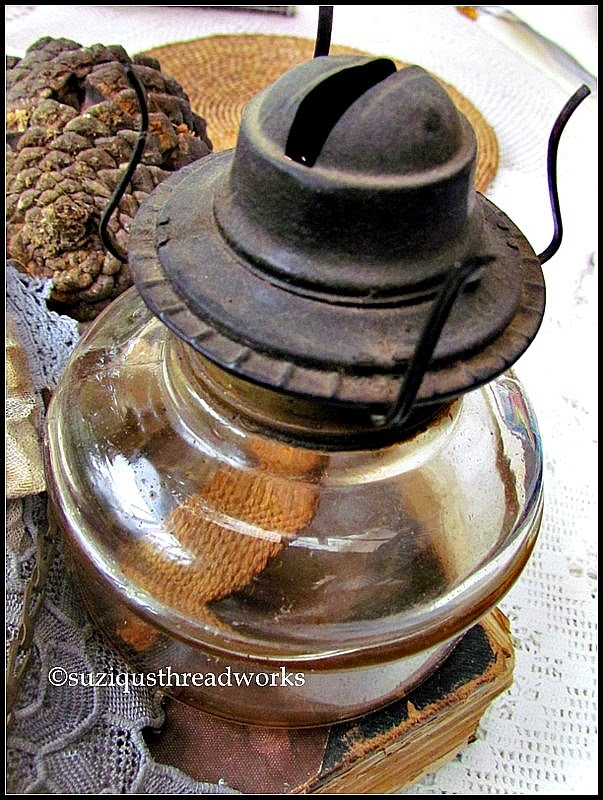 Love old textiles. What can I say? Everything is gobsmackingly gorgeous! Julia is a wonderful friend, talented, generous and the sweetest soul, and the gifts she put together for your are so lovely. And just look what they have inspired you to make! That heart is absolutely stunning, darn how I wish I had your amazing eye for putting things together. Every one of your creations leaves me breathless. Those sweet soldered charms with the bits of lace encased inside! Oh they are precious. All those beautiful hand created flowers too! What a lot of work went into creating each one. A great idea to play around with the dilution of the dye solution to get the different shades. You took all that lovely inspiration and made a fantastic heart in your signature style! What a beautiful gift! I'm not usually a fan of gray but sometimes it's just so quiet and beautiful that I find myself drawn to it. I love what you created with parts of the package and your own beautiful creations! oh my...grey dey tresors abound! 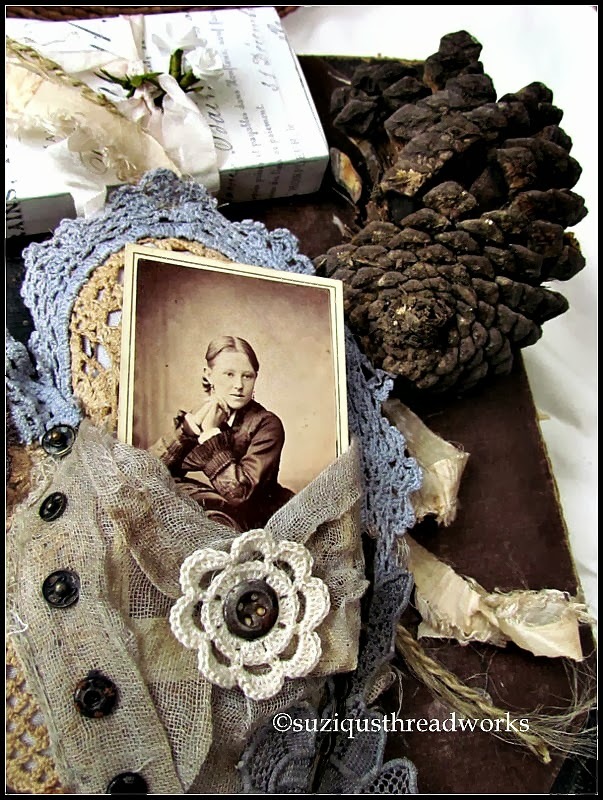 what a gorgeous and thoughtful assemblage dear julia bestowed upon you! you must be in heaven?? love what you've created with them so far. her hand-dyed heart is stunning! happy GD! 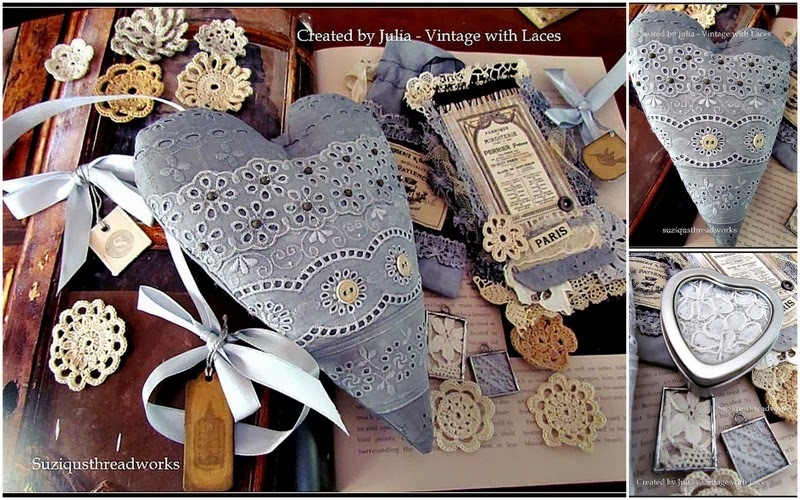 love all the beautiful grey creations dear Julia spoiled you with:) Your vintage heart is simply stunning. Love the image you used. oh wow Suzy- these treasures absolutely take my breath away! I would never have thought of grey in this light-I love it. Very special items and projects. Have a great weekend! Dearest Suzy, what lovely and sweet beauties you recieved from dear Julia,- so many wonderful creations,- and your own heart is a stunning example of your creative amazingness ( is there such a word? )it is just gorgeous my friend. What a wonderful parcel of treasures you received from Julia. 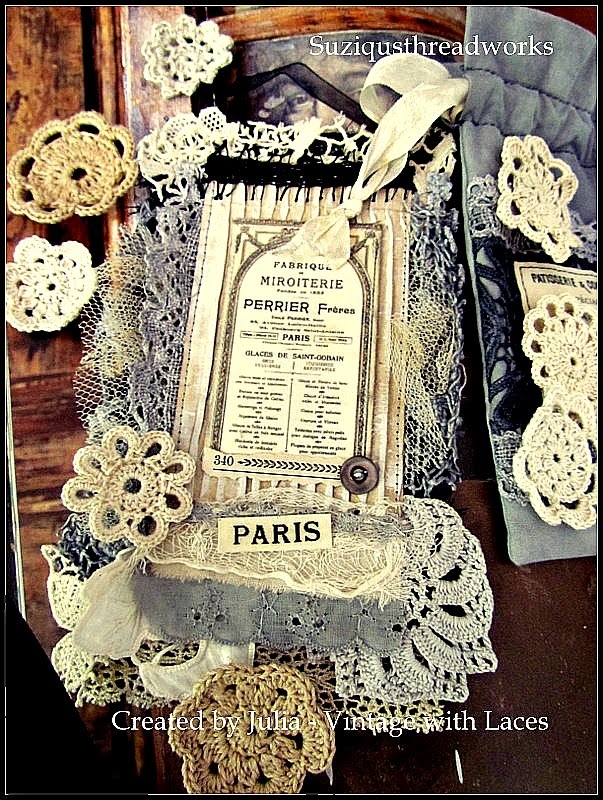 That broderie anglaise heart is just wonderful and all the extra bits and bobs so thoughtfull with you in mind. Your heart is gorgeous, love all the elements you have incorporated to create a heart full of texture and colour. 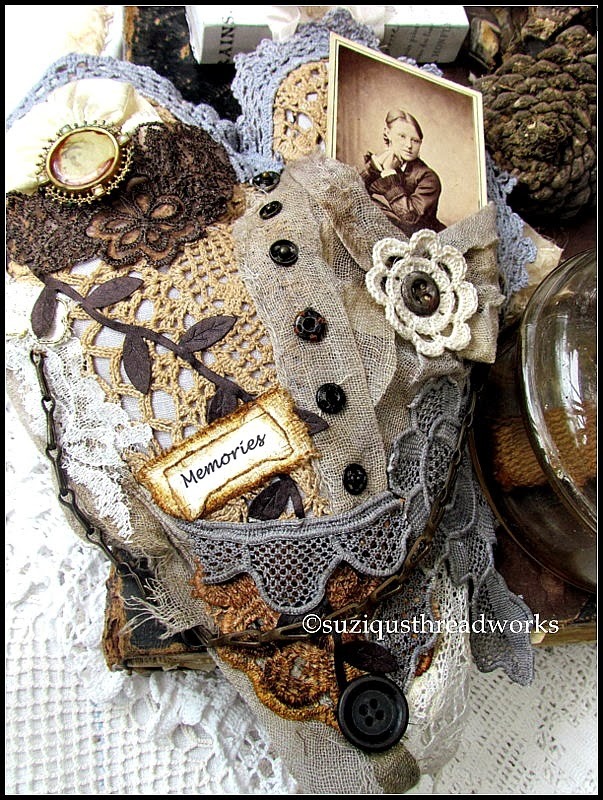 I look forward to seeing your creations Suzy, they always inspire me. Spring is on its way, the crocus and snowdrop bulbs are peeking through. Oh my! Julia is so amazing with her creations! I know you adore these colors and I do too. Julia did such wonderful creating of all the gifts she sent you. Your heart is amazing as well! Wow! I love that you were inspired by her and then created something too. 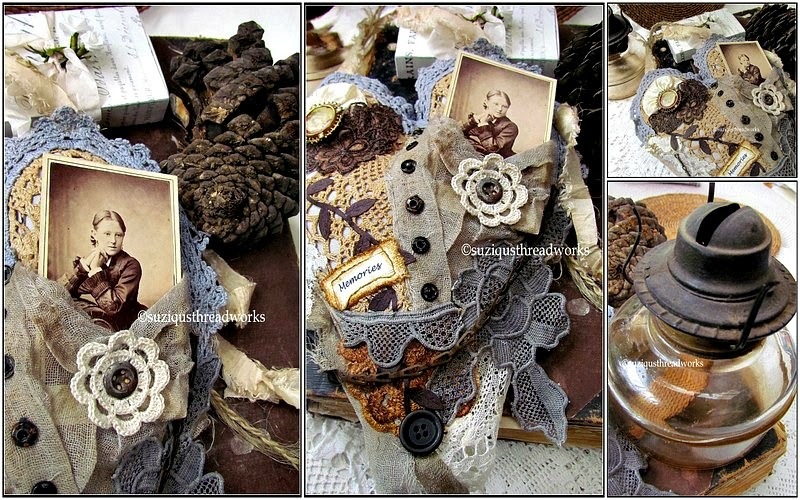 I love the pocket, the buttons, the colors and textures, and chain! It is magnificent! What amazing, beautiful gifts you received from Julia! She does such gorgeous work, I know you adore each tiny thing, I would, too! 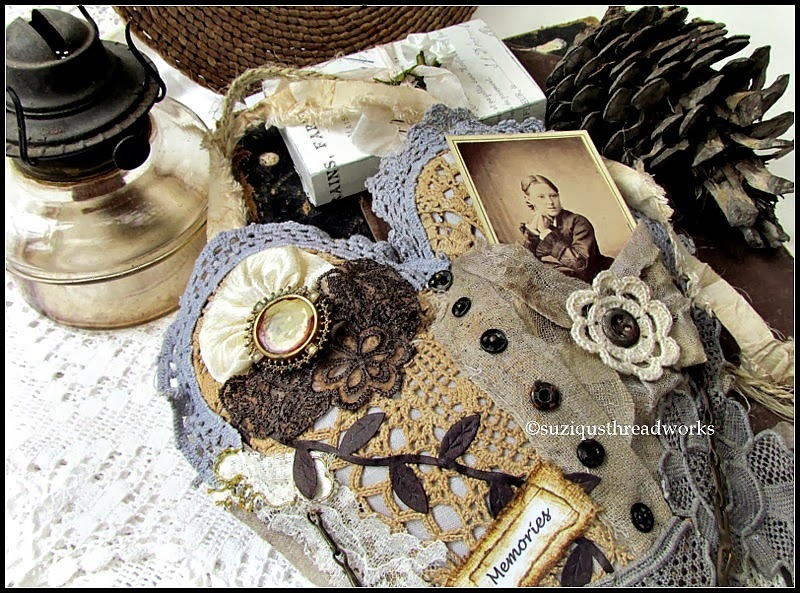 And wow, her inspiration for you...you were off and running with it and made such a lovely piece yourself! 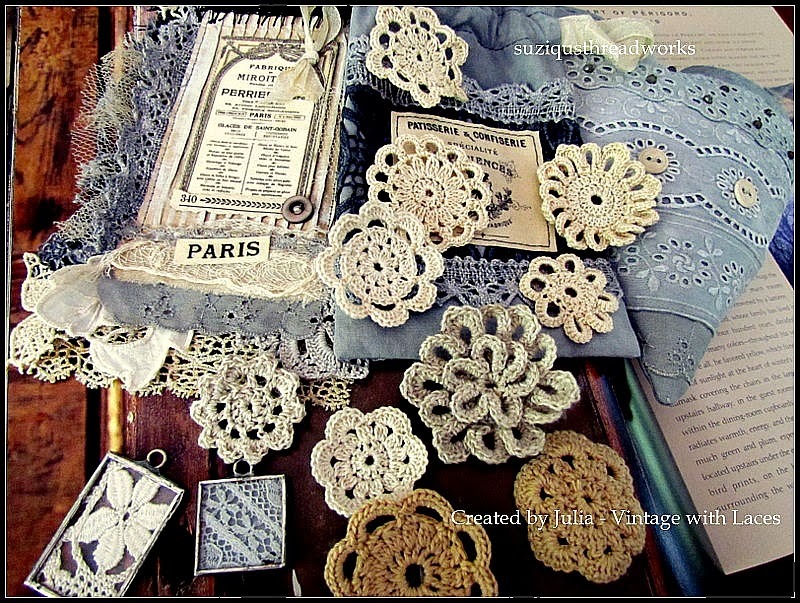 your creations are gorgeous as well, and Julia's crochet flower fit perfectly with the items you chose for your heart. All those pretty crocheted motifs caught my eye! I must get busy and make some. I adore the grey heart you made with the treasure trove of items, dear one!!! Visiting from Grey Dey Thursdey! What a beautiful gift of grey themed goodness. I love the addition of your grey heart. 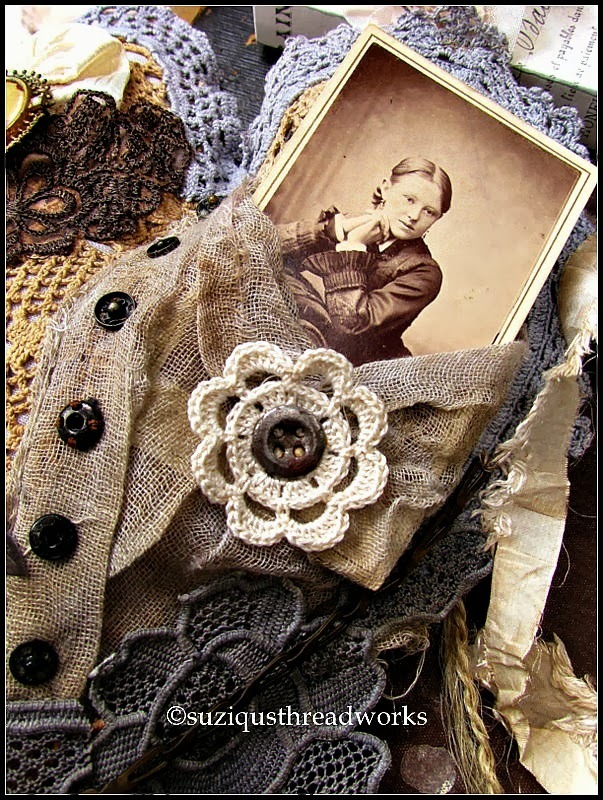 I am off to a slow and stuttering start on my first lace book and needed this post to tickle my muse. Thank you for sharing! 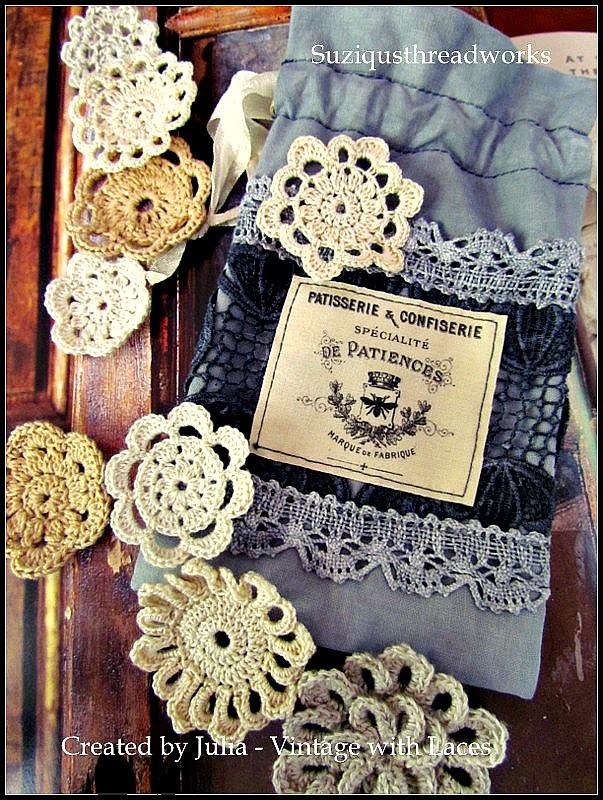 OMGosh ... everything is such a treasure - especially those crocheted flowers. I would love to be able to learn how to create those so that I could use them in my work. You're so fortunate! The beautiful work you gals have created takes my breath away. I really love the grey and will have to try it. It is very grey here in Washington and rainy. But we have had some wonderful blue skies awhile back. Thanks for dropping by to meet the boys. I am preparing for their arrival in 12 days. I know they will help to heal my broken heart! Along with wearing me out, I'm sure. 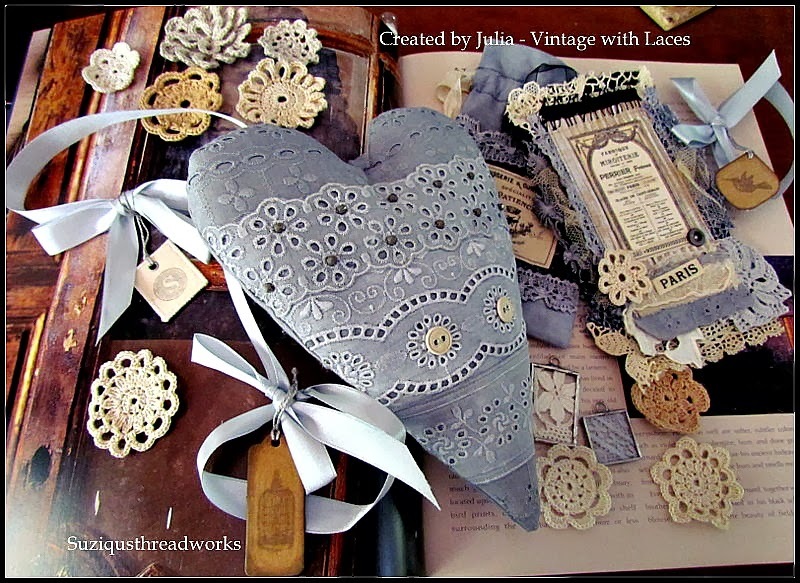 Your photos of Julia's beautiful gifts and your own beautiful heart and vignettes in grey are just stunning dear Suzy! I am going to go over and over them and study all the lovely details in each photo. I am so very happy to have visited you today my lovely friend so far away. Every time I come here I get the urge to go make something pretty!!! Love the colours, unusual for hearts. Dear Suzy, the gifts you received from Julia are all so beautiful. The colors, textures and charming flowers are wonderful. I love how you used one of the flowers in your stunning heart in the same colors! Have a fabulous weekend. 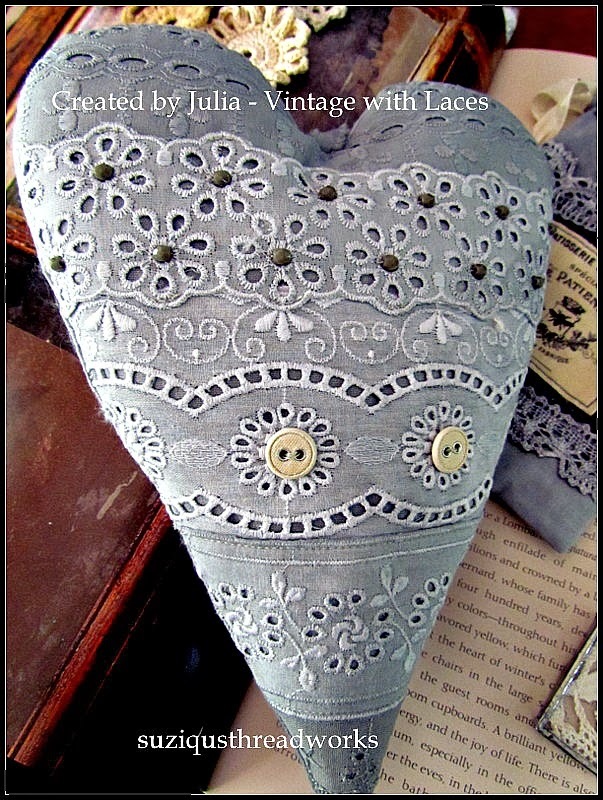 That´s a wonderful gift from Julia - love the grey heart. 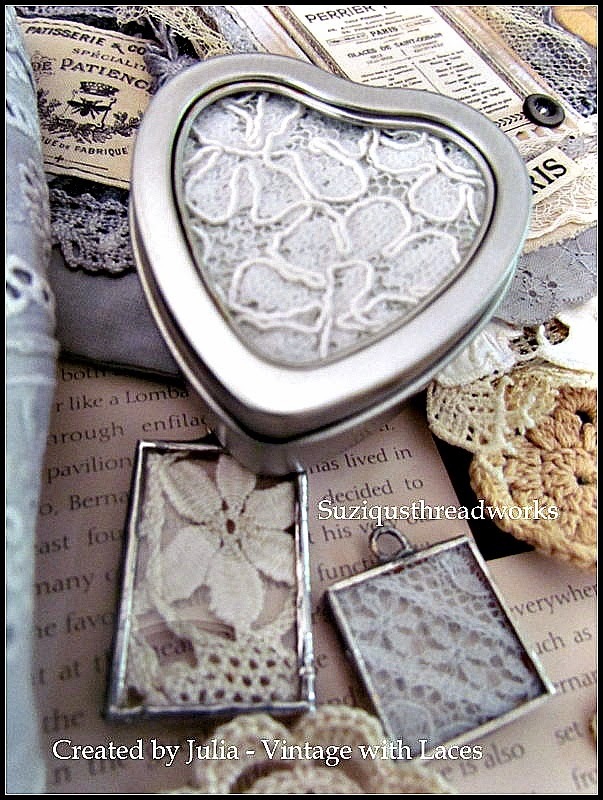 Love your heart too Suzy - it´s SO beautiful with the color combination you have used. How beautiful the gifts of dear Julia! Wish I could crochet like that, the flowers are so gorgeous. And your heart, wow so beautiful with those greys and browns. Very rustic and peaceful feel it has.